I’ve been thinking a lot lately about vehicle miles traveled, or VMT. Specifically, why is it so hard to get people to think seriously about reducing VMT as a climate mitigation strategy? Building on my earlier ode to electric scooters, this post begins a semi-regular series on different aspects of VMT reduction strategies, beginning with an introduction today to VMT and its relationship to climate change goals. We know that the transportation sector is now the biggest contributor to GHGs across the country, and especially here in California. But conversations on reducing transportation emissions have been dominated in recent decades by electrification and fuel economy. Just last month, Jerry Brown said better battery technology was “the only way” to meet our transportation goals. And sure, when we’re all driving zero-emission vehicles that plug into a zero-carbon grid, our transportation emissions will indeed be extremely low carbon. But here’s the thing: that future is a long way off. California’s ZEV mandate calls for only about 8% of new vehicle purchases to be ZEVs by 2025–and that’s just new vehicles. The average car sold today will be on the road for at least 11 years, locking in a decade plus of GHG emissions for every non-ZEV sold. In addition to our long-term electrification plans, we have to focus on strategies to reduce emissions from those non-ZEVs in the near term by getting them off the road. So how do we get better at encouraging people to drive less? The kinds of changes that result in people leaving their cars at home are a lot more complicated than simply adding new bike lanes (and of course, here in LA, even adding bike lanes isn’t exactly a painless process). Emmett Institute staff Meredith Hankins, Daniel Melling, and Garrett Lenahan during 2018’s Bike to Work week. How do we ensure the owner of that non-ZEV that’s going to be on the road for the next decade can afford to live close enough to their workplace to make commuting by car an option, rather than a requirement? How do we provide safe, convenient, and affordable low or zero-carbon modes of transport like public transit, walking, biking, and scooting to get that non-ZEV owner to and from their child’s school? To the grocery store, the library, the movies? How do we retrofit our cities to create dense, walkable, transit-oriented neighborhoods where residents don’t need to own cars at all? Can we do any of this in an equitable way that avoids displacement? Can public transit systems be designed to get middle class drivers out of SUVs while still fulfilling their social service need to help a city’s most vulnerable populations? Should they be? There are no easy, cookie-cutter answers to these questions. Decisions about land use, housing, and transportation require difficult choices and a lot of political will by a lot of different levels of government. For example, it took a 2017 bill (AB 179) to force CARB and the California Transportation Commission to coordinate on these issues. Yesterday, the agencies in charge of our state’s climate planning and transportation planning met for just the second time. Ever. This is part of why VMT reduction doesn’t tend to be discussed in any particularly coherent way–the kind of coordination that’s required necessitates truly transformative change, at every level of government and at the level of individual behavior. But here’s the thing: we can’t afford to ignore significant climate mitigation measures just because they are politically difficult. Quadruple the proportion of trips taken by foot by 2030 (from a baseline of the 2010–2012 California Household Travel Survey). Strive for a nine-fold increase in the proportion of trips taken by bicycle by 2030 (from a baseline of the 2010–2012 California Household Travel Survey). percent, and for a walk and bike mode share of between 10 percent and 15 percent. Programs to maximize the use of alternatives to single-occupant vehicles, including bicycling, walking, transit use, and shared mobility options. So, super easy to-do list for the state right? As I noted, this post is intended to be an introduction to VMT and climate mitigation. Given the coordination problems described above, I hope to use this series to highlight the ways in which wonky transit and urbanism issues should be considered climate mitigation and to think deeper about reducing our transportation emissions from a holistic perspective, all while centering the equity issues that must be key to our approach going forward. Coming soon: tales from a car-less Angeleno; local opposition to road diets; declining transit ridership and neglected bus lines; and digging into this year’s crop of YIMBY densification proposals in the new legislative session (some of which Ethan has already previewed here). My goal with this series is to encourage conversations, so tweet at me with inspiration and questions! I applaud many of the strategies discussed here to rethink our cities. We are already seeing infill projects accelerating is places such as my hometown of Oakland. But many ideas are a very, very long way off and will never account for the challenges that many Californians face regarding mobility. I’ll speak anecdotally at first. While I live in an urban area, my neighborhood is actually more hilly and suburban. Public transit is sparse, biking is difficult because of the terrain, and shops and services are dispersed. When I had younger children, I could not conceive of a way that would get them to their two different schools, and then myself to work, without using a car. I couldn’t conceive of getting them and their friends to baseball practice without a car (let alone all my gear as a coach). And I couldn’t conceive of coming home with three heavy bags and a week’s worth of groceries without a car-like vehicle. This reality will never change for a lot of people. Their neighborhoods are built out. Their transportation requirements will not change anytime soon. So while we talk about new utopian car-less cities, we ignore that vast swaths of our societies are somewhat fixed in place. On the other hand…EV car sales in California are up to more than 6 percent, double what they were just two years ago. Still very small, but that would seem to put us well ahead of where we need to be hit our 2025 goals. This, despite the fact that automakers are still in love with trucks and SUVs, and can easily influence the marketplace with their aggressive marketing tactics that favor the higher-margin gas-guzzlers. It would seem that encouraging or forcing carmakers to increase the fleet of EV (or even hybrid) vehicles could happen far more quickly that some of these other infrastructure changes. Car-buyers won’t always seek out low-emission vehicles, but if that’s what is available, they will buy them. In the meantime, the percentage of new non-ZEV vehicles will decrease every year. Of course, the state population is growing. So the percentage of non-ZEV vehicles on the roads will need to grow even faster, as will in-fill housing and more intelligently designed communities. But instead of giving up on (or opposing) cars, why not rethink them and work more aggressively to make them part of the solution? Thanks for the thoughtful comment Michael. I don’t disagree that there are encouraging signs on EV adoption, and I wouldn’t say that I’m totally giving up on cars. I’m just trying to counteract those who *have given up* on change at the individual level. I get so sick of strategies that start with the default assumption that people will *always* drive personal vehicles, whereas I think we can and should do both (ZEVs *in conjunction with* lower VMT). I’d also add that there are lots of changes that already built-out cities and neighborhoods can still consider. Relatively simple fixes like all-door boarding on buses and more accurate GPS tracking can make a big difference in the convenience of public transit — a big part of increasing transit ridership is just making it easier for people to use. Your point about groceries is also well-taken. Scooters and electric-assist bikes are great for hilly areas, but we really haven’t come up with smart last-mile solutions for transporting kids and groceries. Alissa Walker at Curbed is great at hammering home this point (see, e.g., https://www.curbed.com/word-on-the-street/2018/5/3/17312390/transportation-scooters-bird-spin-lime-san-francisco). As a non-car owner, I take major advantage of various delivery services to get around this problem – but clearly displacing my own vehicle trips with Amazon deliveries isn’t a real solution. 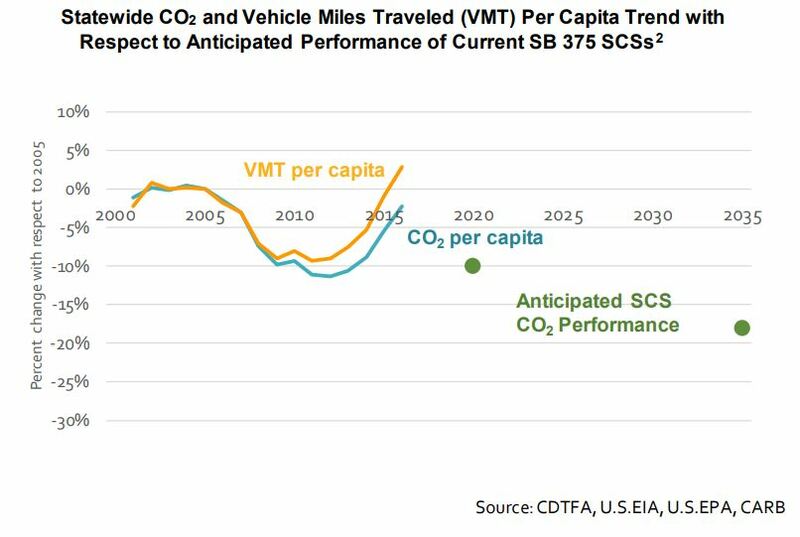 There is no proof and no empirical evidence that reducing VMT actually mitigates climate. That is just more empty rhetoric and pure falsehood which is emblematic of the corrupt climate movement. Like the Yellow Jackets in Paris, we reject such lies. We will defeat such public corruption in like manner going forward. We reject ignorant, irresponsible and deceptive junk science and those who propagate it. We stand on truth – that is why we are winning and we shall win again in 2020. Spit on climate mitigation lies. I agree that increased transit, pedestrian, bicycle, scooter, and densification are all useful contributions to decarbonizing transportation. But as Michael points out, most neighborhoods are sprawled out and vehicle access will be necessary. We must target a 1.5C pathway, and most of those simply imply no new gas or diesel vehicles sold after 2035. Can that be done? Actually, Norway is well ahead of that curve. How do they do it? They tax the heck out of new gas guzzlers–the affluent folks who buy new vehicles lock in emissions for the useful life of the vehicle (typically 150,000 miles for combustion vehicles), so they are the ones who should pay for the pollution of their decision. How much? Around $400 per MTCO2e for the lifetime emissions–that’s ~$30,000 for a full-sized gas guzzler. Is that a new idea? No, the federal Gas Guzzler Tax has been doing that since 1978. It only applies to cars, not light trucks or SUVs, and it applies only to fuel efficiencies worse than about 23 mpg. At little curve fitting shows that it effectively charges about $112/MTCO2e for lifetime emissions in excess of 25 mpg. Why don’t we charge affluent car buyers for their unnecessary emissions (such as worse than the best-in-EPA-class emissions), instead of punishing everyone for fueling the only vehicles they can afford? “why is it so hard to get people to think seriously about reducing VMT as a climate mitigation strategy?” because Global Warming is a hoax perpetrated to increase government power over the people. The latest GISS datasets show a decline in global temperatures, but you”d never hear it from alarmists because AGW is a religion. Why do people that have no interest learning about a particular topic, with the exception of a desire to have negative comments, read articles about topics that they have no real interest in. There are two comments from people that clearly have no understanding of the issue being written about. These naysayers should be concerned about losing status in society, because they cannot adapt to change.